NASA HAS LAUNCHED the OSIRIS-REx  spacecraft on a seven-year mission to Bennu, one of the largest asteroids in the Earth’s neighborhood. In fact, Bennu swings so close to our planet, there is a slim chance that it will catastrophically collide with the Earth in the late 22nd century. 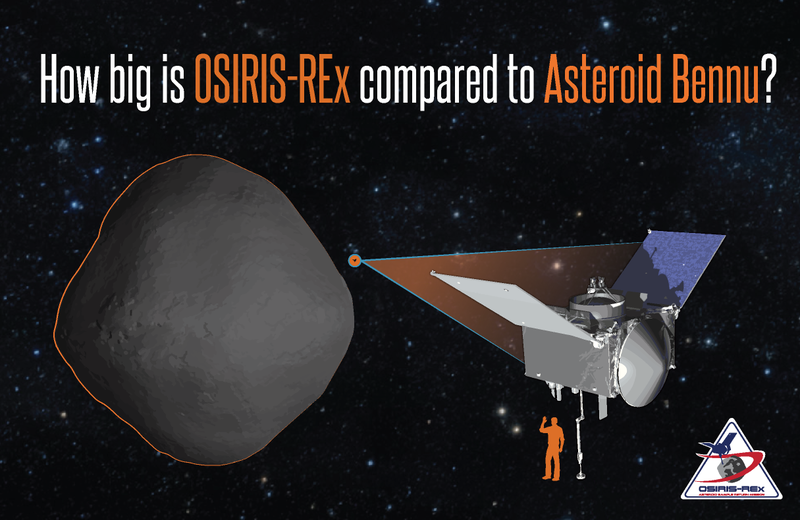 To better gauge the odds of a collision, OSIRIS-REx will study Bennu in unprecedented detail. The spacecraft will get close enough to vacuum off a few pounds from the asteroid's dusty surface for delivery back to Earth—the biggest sample return since the Moon rocks and the first asteroid sample collected by the U.S. The hope is Bennu will tell us about life in both a cosmic and literal sense. An ancient and pristine object, Bennu is like a time capsule, preserving the conditions of the early Solar System when all the planets formed. The asteroid is also loaded with carbon, an essential element for life as we know it, so studying Bennu could teach us more about the origin of Earth’s flora and fauna. No less importantly, OSIRIS-REx will examine how sunlight warms Bennu’s surface, altering its orbit over millennia and potentially putting it on a collision course with Earth. In this way, the mission will help NASA hone its threat assessments for strikes by other nearby space rocks. On September 27, The Kavli Foundation will host a Google+ Hangout with OSIRIS-REx scientists to learn all about the mission’s ambitious plans to investigate an asteroid as never before, unlocking secrets about life and death in the Solar System. RICHARD BINZEL - is a professor of planetary sciences  and the MacVicar Faculty Fellow in the Massachusetts Institute of Technology's (MIT) department of Earth, Atmosphere and Planetary Sciences, and a member of the MIT Kavli Institute for Astrophysics and Space Research  (MKI). He is one of the world’s leading experts on the study of asteroids and a co-investigator on the OSIRIS-REx mission. BETH ELLEN CLARK - is a professor and chair  of the Department of Physics & Astronomy at Ithaca College. The Mission Asteroid Scientist for OSIRIS-REx, she will help its many researchers figure out how to select the best potential sites on Bennu for collecting samples. BASHAR RIZK - is a senior staff scientist  at the Lunar and Planetary Laboratory at the University of Arizona. He is the instrument scientist for a trio of cameras, known as OCAMS (OSIRIS-REx Camera Suite), which will help the spacecraft navigate, explore and sample Bennu. THE KAVLI FOUNDATION: There are many thousands of asteroids in our solar system. 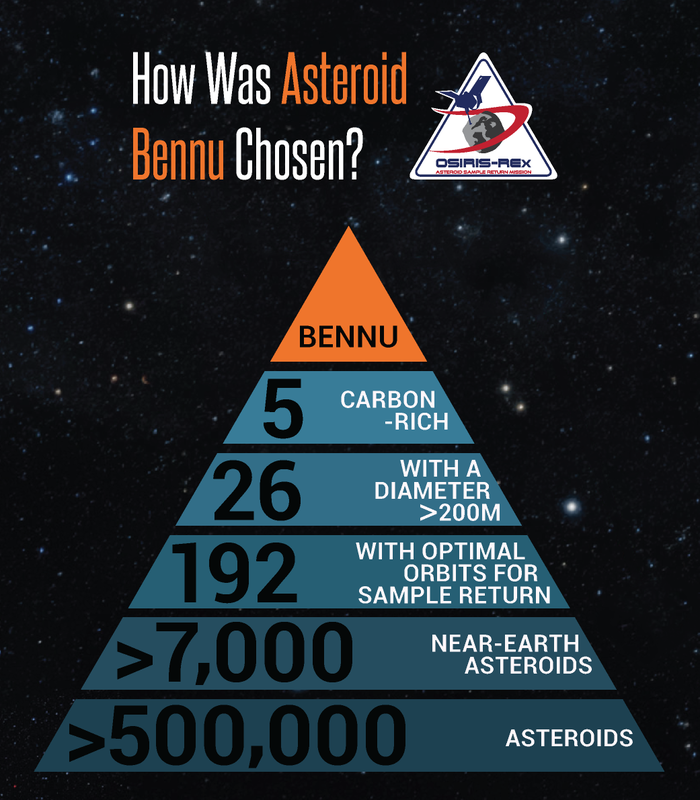 What makes Bennu so special? Why Bennu? RICHARD BINZEL: Indeed, there are about 10,000 asteroids that we know that don’t stay all the time in the main asteroid belt. In fact, they have orbits that come near the Earth, and we as astronomers try to sample those with spectroscopic instruments. We use telescopes to try to decode what they are and what they’re made out of. Out of those few thousand that we’ve measured some basic compositional information on, there’s a subset that are easily accessible. They’re in orbits that are very easy to reach from the Earth. There’s a subset of those that look like they have a very primitive kind of composition, an organic carbon chemistry that we think is like the earliest chemistry of our solar system. When you go through them all with steps, sort of like climbing to the top of the pyramid, you get to this one very special object called Bennu that looks like one of the best places that we can go to try to sample the earliest chemistry of our solar system. TKF: How is OSIRIS-REx specifically designed to answer key mysteries about Bennu? BASHAR RIZK: OSIRIS-REx does what we can’t do, which is to go out in space ourselves and examine this rather remarkable asteroid that is also remarkably accessible to the Earth. So if we think of O-REx as a person, the solar arrays are its arms, the high gain antenna is its mouth that it uses to communicate to the Earth, and on top of its science deck, there’s a sample return capsule. That is the thing that will be used to send a sample back to Earth safely. Behind OSIRIS-REx, almost like a scorpion’s tail, is the sample arm that will reach out, kiss the surface of Bennu and gather the sample. The instruments that populate the top of the deck, including the cameras, are designed to examine this object and make it safe for us to sample and find the interesting spots on the surface of Bennu that we will feel is worth our time to go and collect. So when we get to Bennu, everything will be working in a concerted fashion to try to gather all the information we’ll need to collect a sample safely. TKF: Beth, you and others have described Bennu as a “time capsule” dating back to the birth of the solar system. What does that mean? What might we find by opening this time capsule? CLARK: We hope that by grabbing the sample from the surface of Bennu, we’ll be studying material that was left over from the formation of the solar system in its most pristine state, and that it has not been heated up or processed in the past four and a half billion years. We want stuff that is very close, we think, in composition, to what we see in interstellar environments or to what we see in circumstellar environments, such as aliphatic hydrocarbons and polycyclic aromatic hydrocarbons—molecules that are just really, really primitive and pristine. We think we’ll find organics on Bennu, because our best ground-based data imply that Bennu could be similar to some of our most primitive meteorite samples. We’re hoping to find areas on Bennu where hydrated minerals are right in proximity to anhydrous minerals. This is a very exciting possibility that would go along with having very pristine samples. So if we find these kinds of materials at Bennu, they will all tell us about the early formation time of the solar system. TKF: How are we going to decide what places to sample on Bennu? CLARK: Our main sampling site will have to satisfy four criteria. It has to be safe so that we can descend to the surface with the spacecraft without harming the spacecraft. It has to be accessible such that our flight dynamics team can accurately deliver the spacecraft to the site that we choose. It has to be sampleable, such that it has enough gravel-sized material that our sampling mechanism will be able to capture some of that material and stow it successfully. And, more than anything, it has to be scientifically valuable. It has to be a region on Bennu that we feel gets us closest to our origins in terms of those compositions and textures I spoke about a few minutes ago. TKF: That actually segues us nicely into a viewer question. Stephanie Buckland asks what would scientists expect to find from material on Bennu that would help shed light on the origins of organisms on Earth? RIZK: One of the questions that we might be interested in is what is the handedness of the amino acids in the amino acids that we detect in the sample? Is it left-handed like much of the biogenic amino acids on the Earth or is something else? TKF: The basic amino acids for life, they all have one orientation that we find here on Earth, but there could just as easily be a different orientation. Could you explain that a little bit further? CLARK: This is called chirality. So amino acids have two possible orientations in nature, in chemistry and physics. And yet, in most of the biology on Earth, we only find one chirality. So what happened to the other side, the other side of us? I think the other interesting molecules we’ll be looking for are the organics, the hydrocarbons, and what state are they in. What are their ratios compared to each other, and what does that tell us about Bennu in relation to what we can see about other planet-forming regions? BINZEL: It’s the complexity of the hydrocarbons that we see as well. Do we get all the way to amino acids and so forth? I think it’s really trying to understand how complex is the carbon chemistry of our solar system, or how complex was it at that very early stage? RIZK: And don’t forget, we’re trying to understand the basic origin of the solar system itself, so one of the big questions is: how well mixed is the material of the earlier solar system? Did it separate into zones that didn’t have much contact with each other, or was there a lot of mixing back and forth? That’s something that Bennu might be able to answer. TKF: Another part of the OSIRIS-REx mission is to try to nail down the odds that Bennu might someday collide with our planet. How real of a possibility is that? Richard, let’s put this question your way first because you’re the creator of a scale that grades the danger post by asteroids. BINZEL: The scale is called the Torino Scale, which looks at the prospects in the coming century of any kind of impact. 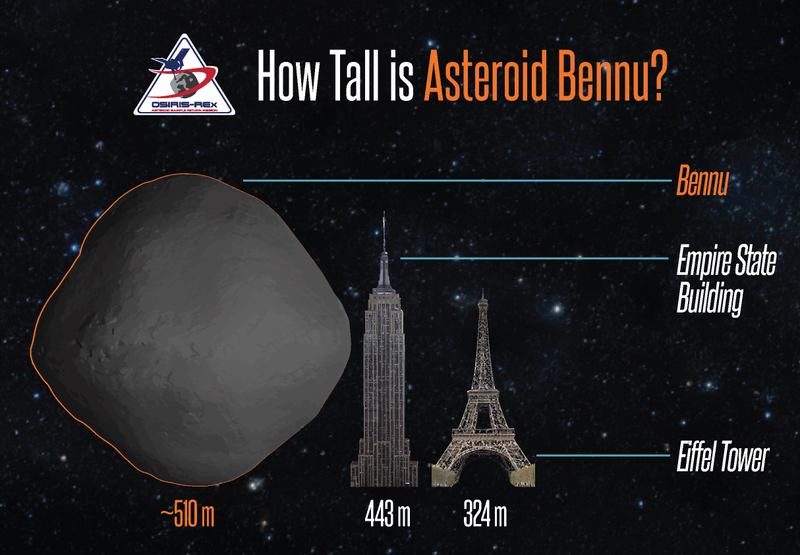 The chance of Bennu’s impact is so far in the future and so small, thankfully, that it doesn’t even really rank on this scale. So that’s good news. Eventually time will get there, but the number is one chance in 2,700, and I like to say that’s a 2,700-to-one odds in our favor that at the end of the 22nd century, when Bennu comes close to the Earth, that it will miss. One of the things we most likely will find out with OSIRIS-REx is we’ll measure Bennu’s orbit precisely. We’ll find out that it is, in fact, not any threat, even in the far distant future. But one of the key things we want to find out is how does Bennu feel it’s way around in its orbit in response to how it’s being heated by the Sun. There’s something called the Yarkovsky Effect that will heat up the asteroid and when that heat radiates away, it provides a little tiny push on the asteroid. If you do that over decades and centuries and thousands of years, you can slightly change the orbit. So that’s something we want to understand about Bennu itself so we understand its potential in the long-term future. But I think more importantly, it’s not really just about Bennu. It’s about trying to understand how all asteroids respond to this kind of subtle pressure in the solar system so that we can better understand the many asteroids known in the vicinity of the Earth. Just what are their prospects? What are their hazards looking literally centuries into the future? TKF: A lot of viewers are asking: What if Bennu did hit Earth? BINZEL: The chances are incredibly small of Bennu posing any threat, even for the long term. But an object of the size of Bennu, about 500 meters across, hitting the Earth would end up making a crater on the Earth’s surface. The estimate is about a three-mile-wide crater, and that would really be bad news for a congressional district or a few congressional districts were it to land there. So the impact is certainly quite small compared to the literally catastrophic impact that we think damaged the ecosystem of the Earth 65 million years ago, at the end of the Cretaceous Period. The result of that was 80 percent of all the species living on the Earth perished over some very short interval of time, including the dinosaurs. We think the dinosaur demise was due to an asteroid impact. So Bennu, in the grand scheme of things, is not the end of civilization. It’s not the end of life. It’s just a really bad day for a substantial region of a country. These things do happen over thousands and thousands of years’ timescales. The good news is in the short term. RIZK: Just to add something to what Richard said, the object is believed to have wiped out the dinosaurs is probably of the order of 20 times the diameter of what Bennu is, and scaling up in mass, probably about eight thousand times the mass. So it’s a different order of object entirely. CLARK: With the thermal emission spectrometer experiment in particular, we hope to measure the thermal inertia of Bennu, and by extension, understand how the thermal inertia of other small objects that are in near-Earth orbits will affect their orbits over time. So we hope to really pin down how well we can extrapolate the orbits of these asteroids into the future, and narrow down their possible positions in time and space so that we have a better understanding of the motions of a lot of small asteroidal objects like this, not just Bennu. TKF: Let’s throw in another viewer question. James from Cambridge is asking what is the difference between an asteroid and a meteor and a meteorite? BINZEL: This is a great question. An asteroid is an object in space. If an object is entering the Earth’s atmosphere and is in the process of vaporizing in the atmosphere, we call that a meteor. Most meteors you see, like the recent Perseids meteor shower in the summer, are really tiny grains of dust. The reason they glow is they’re moving so fast when they strike the air molecules that they heat up. The little dust grains actually vaporize and they create light, and you can see it. Finally, you get a meteorite if one of those objects is large enough, sort of the size of a beach ball or a small car, that it can break apart into fragments that can survive to reach the Earth’s surface. Those samples that we pick up are called meteorites. So a meteorite is a sample, and this is a pretty famous little meteorite sample. [Shows meteorite sample on camera.] It’s called Tagish Lake. It’s a carbon-rich kind of meteorite. We think Bennu might be something like this, but the difference is that the sample we’ll get from Bennu will be pristine. It will never have been contaminated by the Earth. We hope we’ll see as pristine or as old and organic-rich as any object we’ve every sampled before. TKF: Another viewer question, on Twitter, Linda Marceau asks, how many kilometers will OSIRIS-REx travel to Bennu and back? I’m going to send this one over to Bashar, and if you can give the answer in miles too, and also just give us a feel for what OSIRIS-REx’s overall journey will look like. RIZK: The number is close to six billion kilometers, or four billion miles. Bennu is in an orbit that takes it around the sun five times for every time the Earth goes around the sun six times. So it’s in a six-to-five resonance with the Earth’s orbit, which is unusual and makes it practically a next door neighbor or even a satellite of the Earth because clearly the body in the solar system that is most influential over the fate of Bennu is the Earth. So to go to Bennu, the best thing to do is to launch your spacecraft at the time when Bennu and the Earth share approximately the same region of space. Every six years, they come to this spot. We didn’t do that. We launched a year early just to give ourselves an extra year in case something untold happened while we were constructing our spacecraft. So when we meet here again, if we do in September 2017, a year from now, Bennu and the Earth will be at that special location. At that point, O-REx is going to dive under the Earth and then get a little tilt upward into Bennu’s orbit, and then join Bennu after about a year in space. At that point, it will have about two-and-half-years at Bennu to do a lot of investigation and hopefully gather a good sample, then about two to two-and-a-half years to get back. So by the time it comes back in 2023, it will have gone around the Sun six times by my count. TKF: Let’s talk a little bit more about the sample collection itself. OSIRIS-REx is going to use a new method for collecting material. The spacecraft will get to within two to three meters of Bennu, then extend a robotic arm that has a suction cup-like device at the end of it. That device will spray a blast of nitrogen gas to knock material off of Bennu and into the collection cup. So that sounds kind of complicated. 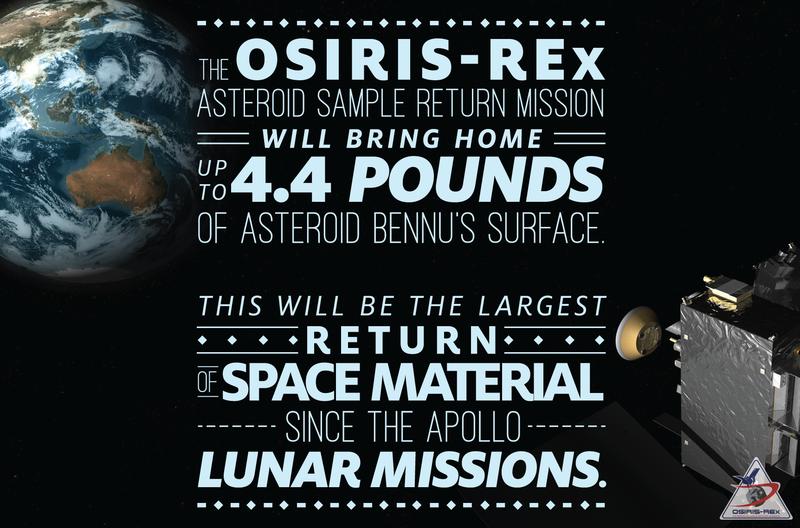 Why not just try to land on Bennu and scoop up a sample? RIZK: It’s not so easy. I mean, I should think anyone watching the fate of Philae, that marvelous lander on the Rosetta mission, would get an idea of how complicated it is to operate and touch and stay on a body with as little gravity as Bennu. Some years ago, we were part of a study that tried to look at all the different ways you might want to gather material off an object like Bennu. We examined something like 20 to 25 different ways, and I think most everyone at the end of the study who had participated was convinced that we had the best way. TKF: With regard to asteroid mining, a number of companies are looking into sending spacecraft to asteroids in the future to extract precious metals and materials. How will OSIRIS-REx help pave the way for this sort of activity in the final frontier? CLARK: One of the things we’re going to learn a lot about is how to operate in very low gravity environments, what we can get away with doing, and what we can’t do. We’ll learn how to work with the time delay and we’ll measure the gravitational field of the asteroid, as well as the forces that we feel as we descend to the surface and touch down. We’re going to learn a lot about operations in these very low gravity environments. These lessons will be helpful for similar operational environment scenarios for the future. BINZEL: I’ll follow up in terms of what Bennu is made out of. When you send humans into space, they get thirsty. We think asteroids like Bennu, if water is available in any of these objects, is the kind of object that might have a fraction of a percent of its total mass in water molecules that somehow you might extract. So it’s a good test. It will be one of the things we want to understand when we get the sample back—does it show any potential for being a source of water in space? RIZK: Could I ask you guys a question? Do you think that there is water there one meter beneath the surface? I heard that suggested in a talk recently by John Lewis, who’s the chief scientist for Deep Space Industries, an asteroid mining company. Objects like Bennu, even though they’ve been around the Sun, would have been protected and store a reservoir of water beneath the surface, he suggested. No? CLARK: I don’t think so. I think that’s not very likely given the current thermal models and disruption models for these asteroids and how they’re impacted over time in near-Earth space, et cetera. BINZEL: We wish it were true, but in all likelihood, it’s not. TKF: Regarding the history of sample returns, Bennu will not be the first space rock material we’re bringing back to Earth. What’s been done previously and how will Bennu make advances? BINZEL: Beth, why don’t you talk about Hayabusa? CLARK: As we mentioned, it’s very difficult to maneuver a spacecraft around these low gravity bodies. With Hayabusa in 2005, a Japanese exploration mission with American collaborators, we learned that up close and made several difficult maneuvers that didn’t go as planned. Unfortunately, the sample acquisition mechanism was only able to trap a few grains. So we only have a few grains from a small asteroid that have been returned to Earth by humans. We have a few missions that have come back with samples from the tail of a comet and with samples from the solar wind. Apart from the Apollo rocks that the astronauts reached down and grabbed up and brought back in the spacecraft from the moon, I think that’s pretty much it for the United States so far. So getting up to two kilograms of rock, gravel and soil and the very optical surface of an asteroid, with a controlled and well-manipulated spacecraft down to the surface, gathering material and storing it in the sample return capsule—that will be a new event for us in asteroid operations. BINZEL: We’re getting a sample and we know it’s environment from which it comes. In other words, we will have a context for this sample. We will have been studying the asteroid for more than a year to try to pick out where we’re going to get that sample from, and we’ll know how representative that spot is relative to everywhere else on the asteroid. So it’s not only that sample, but it’s the context. We’ll know everything about it. Meteorites are fantastic, but they don’t come with return address labels. That’s their problem. So we love them in our laboratory. To get these meteorite samples is one of the best things that happens in science. But without that return address label and the context, it’s really hard to piece together this early history of the solar system that has us all so fascinated. CLARK: I was going to say, where did you get that sample of Tagish Lake, Rick? BINZEL: It’s from the MIT meteorite collection. CLARK: I’d love to have a piece of that! TKF: Are there other missions like OSIRIS-REx in the works that might visit an asteroid soon, perhaps one unlike Bennu? BINZEL: There are, in fact, a lot of asteroids that are in relatively accessible orbits to the Earth. But one of the fascinating things and in a sense, it’s a problem, and it’s a thing that bugs me, is we really know of only a fraction of all these asteroids that are in the vicinity of the Earth. Our survey capabilities are still in their early stages. If we had more extensive surveys to penetrate and discover objects down to smaller and smaller sizes, we’d find that things 10 meters across, about the size of a boxcar, come wandering through inside the orbit of the Moon every week. So there are a lot of these objects out there that have great potential for exploration, great potential for space resources, but we simply don’t know about them. We don’t have the capability to find them many years in advance and then plan a mission to them. Many of them you see in the news pop up from time to time that we happen to find one a couple of days before it comes wandering by. That’s just the beginning of our capability. I’d like to see us really catalog these millions of accessible objects that come very close that future miners or future astronauts can go and interact with. CLARK: Some of these asteroids are destined to fall toward the Sun. Because the sun is so bright, we can only see them falling toward the Sun and evaporating as they get very close. But other small asteroids are still out there in orbit. TKF: Sounds like we have a lot more potential future targets for missions like OSIRIS-REx?